In today’s fast-evolving mobile age, it’s comforting to know there’s one mobile app trend that’s consistent. That trend – or reality – is that the very things that made the web a success – its being instantaneous and interlinked – apply to the future of apps. With billions of consumers using mobile web and Google search, the vast majority of your customers are choosing to access your services using the convenience and familiarity of the web – instantly available and web-linked – rather than the time-consuming experience of downloading apps from the app store. With the web still being the default choice though, many brands and organisations are still not 'doing' mobile web right. While they focus on delivering rich experiences via apps (only a quarter of which are actually used once installed), the mobile web experiences consumers are seeking are often pared-down, and lacklustre in comparison – and they’re still principally built and tested on desktop. One explanation for this is that getting mobile web experiences right is fraught with complexity. We’re sure that anyone who has delivered a mobile product will be familiar with some of these challenges. Thankfully though, tech titans like Google are providing new ways to transform mobile web experiences, get closer to your customers, and future-proof your business. To get ahead of the curve, these are the three mobile app technologies you need to be thinking about NOW to ensure you’re making the right platform decisions for the future. Progressive web apps (PWAs) use modern web capabilities to deliver an app-like user experience, by bringing features we expect from native apps into the mobile browser experience. They use standards-based technologies and run in a secure container accessible to anyone on the web (definition by Ionic, for whom Inviqa is an Ionic Trusted Partner). 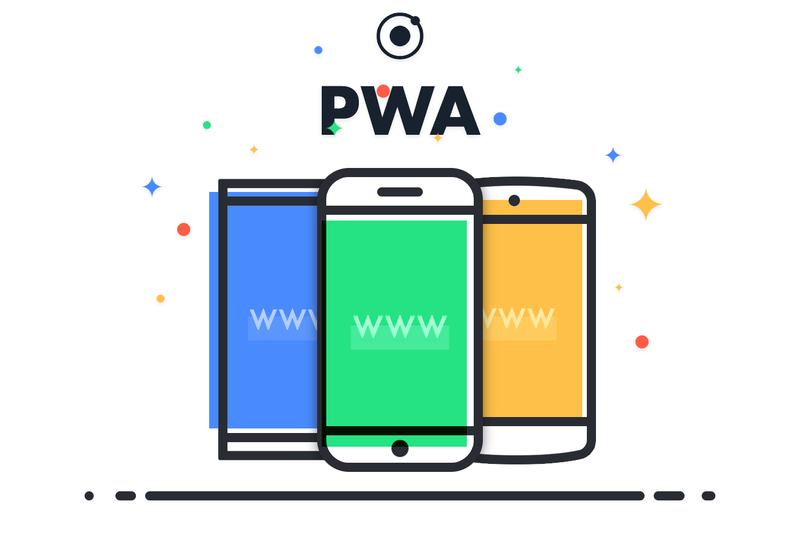 Paving the way for more consistent experiences across web and native apps, PWAs promise to push the boundaries of mobile web, helping brands reach more users beyond the confines of the app store. 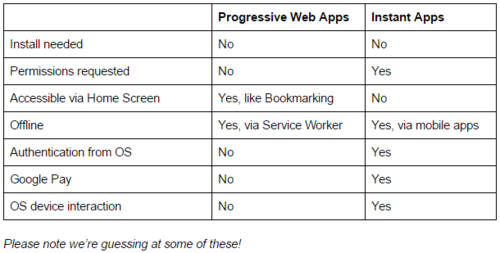 Google is leading the charge here; its Chrome team is front-running progressive web apps. This new means of mobile service delivery – together with the growth in conversational UI (more on that in a separate blog post) – points towards a future where your tech stack will be split into smaller, decoupled components. This is a trend we’re seeing across software delivery as a whole, and not just in mobile. Yes, this makes life harder for your tech teams. After all, it requires specialist skills and knowledge that you may not have in-house yet, so finding the right technology partner with the right capabilities to help you to accelerate, has never been more important. But it also paves the way for powerful new experiences. Once you get the prompt (as pictured above), a PWA is added to the mobile OS home screen, so the benefits you get are very similar to an installed mobile app (but for far less effort on the user’s part). Google has announced Android Instant Apps – a way to get users to your flagship Android experience from links that would otherwise open a mobile web page – without them needing to install your app first. Using deep links including search, social media, and messaging, Instant Apps promises to transform the discovery and sharing of apps by removing the need and tedium of app installation. Brands can expect a micro-app-like interface with the full power of the Android stack. The new API is only available to a private Beta group of developers (presumably those apps that Google is interested in launching with Instant Apps). The introduction of support around authorisation, permissioning, and payments gives Instant Apps an exciting edge over progressive web apps. That said, this functionality is likely to become available on PWAs in the near future. Of course any decision you make around Instant Apps or progressive web apps will be influenced by whether you have made your investments into native or web apps respectively. If you’re invested in native, then Instant Apps are viable for you. If you’ve invested in web technologies, then PWAs are an appropriate next step. Despite the growth of the mobile web, a portion of your customers will continue to engage with your brand and access your services via native apps, thanks to the rich experiences they provide. Thankfully, those experiences are also set to improve with the advancement of near-field communication (NFC) and beacon technology. Apple’s iBeacons claims to open ‘a new world of possibilities for location awareness’, as well as new opportunities for interaction between iOS devices and iBeacon hardware. For now, iBeacons seems to be biding its time and is yet to make much of an impact in retail. Part of the problem could be iBeacon’s slight platform imbalance issues. iBeacons are needed for the apps to work and iBeacon-enabled apps are needed for people to buy iBeacons. With Nearby, this is device-to-device so could be much more effective. Location-aware, un-peered features are still underused today, but with the addition of Nearby – which lets you communicate via Bluetooth to nearby devices – and Android Beam – designed to make the most of NFC – this could be different. It’s an exciting space to watch. Tech giants like Google are helping to break down the barriers to mobile app adoption. The emergence of progressive web apps (PWAs), Instant Apps, and new beacon technology are all set to transform the mobile user experience. The bad news? This stuff isn’t easy. And if you lack resources or in-house capabilities, you’ll need a specialist partner to support the strategic planning and technical delivery. The deconstruction of apps into micro, decoupled services will make it tougher to deliver powerful customer experiences. But that’s why it’s so important to start thinking about these emerging technologies now. There’s too much at stake to NOT get mobile right. Fail to keep pace with the experiences your customers are demanding – and the beta technologies your competitors are undoubtedly already testing – and your business runs the risk of being irrelevant in five years’ time. Interested in learning more about the future of mobile service delivery? Talk to us!